I came across this app the other day that can be used on either a tablet or cell phone that I thought would be useful for many of you caregivers. This app is a “portable stress management tool” that teaches you diaphragmatic breathing, a technique that’s been taught for centuries as a way of reducing stress and decreasing the body’s fight or flight response. Choose the breathing cycle that’s right for you, and the app makes it easy to practice. As you develop your skills, you can begin to “belly breathe” as you walk, drive, watch TV, attend meetings and perform other everyday activities. Breathe2Relax is a portable stress management tool. Breathe2Relax is a hands-on diaphragmatic breathing exercise. Breathing exercises have been documented to decrease the body's 'fight-or-flight' (stress) response, and help with mood stabilization, anger control, and anxiety management.Breathe2Relax can be used as a stand-alone stress reduction tool, or can be used in tandem with clinical care directed by a healthcare worker. Capitalizing on touch-screen technology, a user can record their stress level on a 'visual analogue scale' by simply swiping a small bar to the left or to the right. Breathe2Relax uses state-of-the-art graphics, animation, narration, and videos to deliver a sophisticated, immersive experience for the user. What is the purpose of Breathe2Relax? Breathe2Relax was developed to teach a skill called diaphragmatic breathing, sometimes called "belly breathing". This kind of breathing has been taught for centuries as a way of turning on the body's relaxation response. This app, using smart phone technology, allows you to learn and practice this skill on your own or as part of a stress management program supervised by your healthcare professional. The app also provides detailed information on the effects of stress on the body which you should become familiar with. Can I use diaphragmatic breathing to help during very stressful situations? Yes, it can be useful during highly stressful situations, but it's important to understand that it is not an immediate antidote to high stress. Diaphragmatic breathing will not immediately slow a racing heart or filter adrenaline from you system. Many people make the mistake of trying to use the skill only during times of high stress, and when they don't feel immediately better, they conclude that it doesn't help. Like any stress management skill, diaphragmatic breathing requires practice and regular use. Am I supposed to close my eyes (I feel more relaxed that way)? During the initial learning process it's best to keep your eyes open so you can watch your stomach as you practice breathing from your diaphragm. You'll want to see your belly rise and your chest stay motionless as you breathe. After you're confident that you have mastered the skill, you can certainly close your eyes if it helps you to relax. Remember though, that the best results will occur when you develop the habit of belly breathing as you go through everyday life, walking, driving, watching TV, etc. Practice as often as you can. One of the advantages of having this information on a smart phone is that your practice opportunities are available anytime you have your phone with you. Yes, as long as they are comfortable. The audio instructions are important as you begin to practice this skill and you should make use of them whenever possible. Do I have to practice lying down? What if I want to use this out in public? Practicing while you are lying down isn't necessary to learn this skill. If, in the beginning, you have any difficulty breathing from your belly however, lying down with a book on your stomach so you can watch it rise and fall as you breathe, can be a great help to make sure you are practicing the skill correctly. As you get more comfortable with the skill, practice it whenever and wherever you can. The goal is to make this your natural way of breathing. How can I slow down/speed up the pace of the breathing exercises? In the Practice area of the app you can use the Shorten or Lengthen buttons to change the pace of the breathing exercise to match a pace that is comfortable for you. You can also set a pace for inhaling and exhaling by going to Settings > Cycle Settings and following the instructions for using your natural breathing cycle as the basis of the practice settings. You can also change the number of practice cycles in the Practice exercise from the default setting of 16 cycles. Are there any cautions I should be aware of regarding diaphragmatic breathing? For persons with lung problems or those who simply have a weak diaphragm, this exercise might be tiring at first. Be sure not to overly strain or injure yourself and stop if you begin to feel discomfort. If you have serious pulmonary issues, consult a doctor before attempting diaphragmatic breathing. Music lights up the whole brain, “like the sky during a fireworks display,” said Kyle Wilhelm, MA, MTBC in the Music Therapy Services department of West Music. 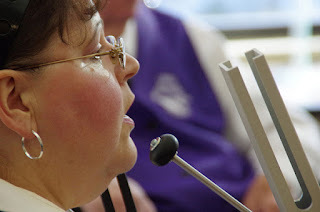 This seems to bring delight as the Aphasia Tones choir, the Chime Strokers and singer Toni Hickman experience firsthand. Music is always an important part of Retreat & Refresh Stroke Camps, which are held all over the country. A music therapist is hired for each camp and leads singing, drum circles and instrument playing during the camp weekend. During 2010, several music therapists at the Peoria camps brought hand chimes, which allowed campers to make beautiful music with little effort. 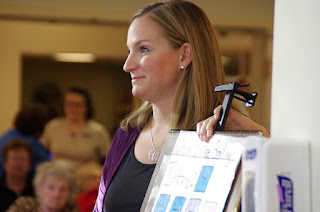 “Hand chimes are a perfect instrument for survivors, since you only need one hand to play it,” said Lauren Kramer, a music therapist and director of operations for Retreat & Refresh Stroke Camps. The campers loved them, and some suggested forming a chime choir in the Peoria area. Several campers even committed themselves to being in the choir! After raising enough money to buy a set of chimes, which cost over $1,000, the group officially began practicing on Tuesday nights. That fall of 2010, the choir met a few times and played at a camp fundraiser in October. And the Chime Strokers, a tone chime choir, was born. The original plan was for the choir to comprise only survivors, but at their first performance they needed more hands and some caregivers were recruited. “Now those caregivers really love playing with the group,” Kramer said. When the Chime Strokers started, there were two directors, “and we would just point to the person when it was their turn to chime,” Kramer said. When one of the directors relocated, Kramer started using flipcharts, with chords denoted by colors and notes by letters. Kramer points to the chart and the chimers are responsible for following along and playing at the appropriate times. The method is therapeutic for the survivors because it helps with their motor planning, hand-eye coordination and focus. There are a dozen Chime Strokers plus a couple of alternates. 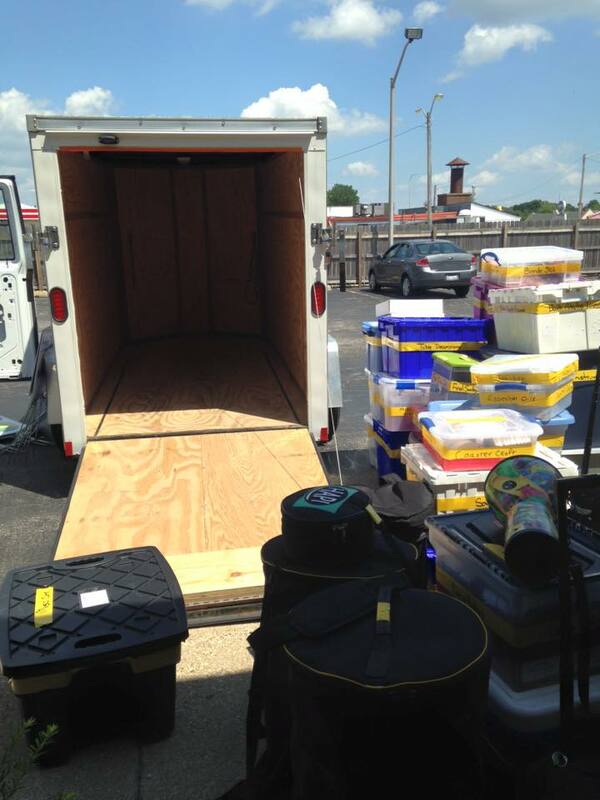 They play 10-12 performances each year at hospitals, churches, nursing homes and networking luncheons. The Chime Strokers perform a song called Let Me Do that was inspired when breakout groups at Stroke Camp responded to the question ‘what do you want others to know about you and recovery’ — their honest responses were later put to music and Let Me Do has become the group’s signature song. August 19-21, 2016 was one of the best camps I've had the privilege of attending. I know, if you've been taking notes you know I said that last year. Well it's true. It was held again at the Lutheran Outdoors Ministry Camp (LOMC) located near Oregon, Illinois. We've used this camp grounds several times now and it is a terrific place with lots of scenic beauty and wildlife. During morning walks we have spotted deer, turkey, coyote, and many birds. This year was no exception. 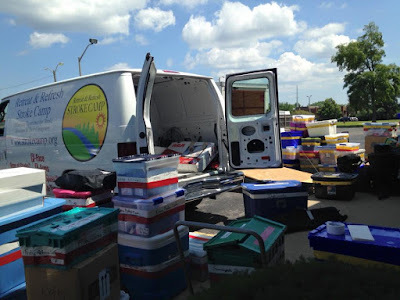 Again this year we had two camps going on the same weekend so we had to pack both the van and the trailer. There were many repeat campers this year as in the past. More than half had attended more than one camp this year at this location. There were two camps held this year at LOMC a couple months apart and most of the repeats attended both camps. Now tell me, don't you think this bunch looks great just like last years bunch? We were housed comfortably in three beautiful locations. Here are two of them. We usually have fishing on our agenda for the weekend also however this year it got rained out. One camper and volunteer did manage to avoid the rain and got to enjoy the paddle boat. 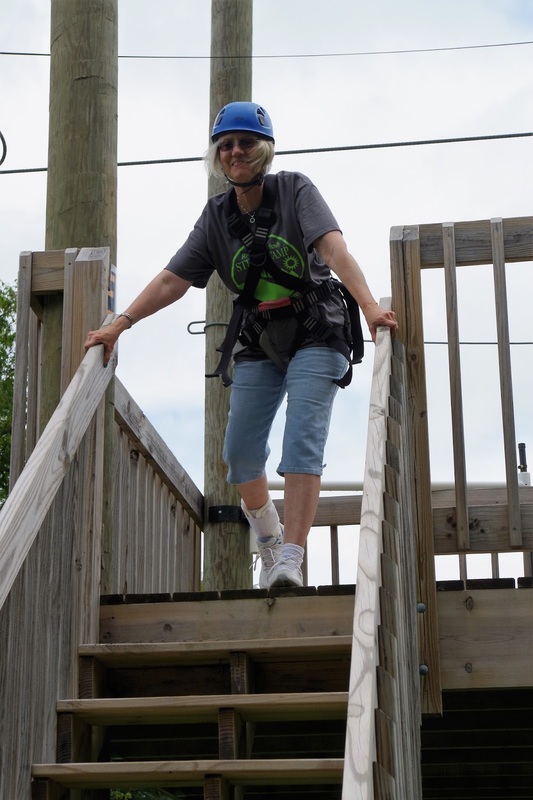 This year we were able to repeat an unusual treat in that we were able to help our stroke survivors and their caregivers enjoy the zip-line that the LOMC camp has on-site. I wish you could have seen the excitement of the survivors as they did this. Plenty of assistance was available to help them enjoy this. Survivors who were able to at least stand alone, even without the use of their hands were able to experience this. We also do crafts, entertain our campers with skits, and always have a special, fun filled Saturday evening program for your enjoyment. And always our signature drum circles. This year led by Music Therapist Kristin Conrad.